Chocolate Gingers are the connoisseur’s choice. 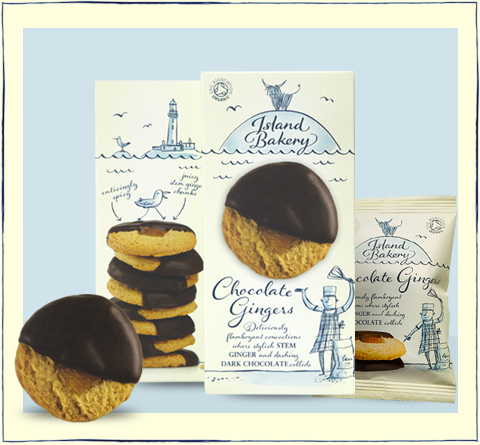 It is no surprise that the biscuit cognoscenti are attracted to the generous chunk of moist stem ginger peeking out from beneath dark chocolate drapery, nestling on a subtly spiced ginger biscuit. Who wouldn’t be? Ingredients: Flour (WHEAT), Dark Chocolate 26% (Cocoa Mass, Sugar, Cocoa Butter, Vanilla Powder), Butter (MILK), Sugar, Crystallised Stem Ginger 8% (Ginger, Sugar), Invert Sugar Syrup, Powdered Root Ginger 1.5%, Sea Salt*, Raising Agent*: Ammonium Carbonate. *non-organic.